Leading USA bellman and luggage cart manufacturer, Glaro Inc., goes into high gear to help hospitality industry upgrade carts before summer travel season. Glaro Inc., a leading USA manufacturer of bellman carts and luggage carts, has ramped up its cart production in anticipation of the busy travel season. Glaro Inc. is known for meeting the increasing needs of hotel and hospitality industry facilities to sustain quality service levels and operations. Glaro Inc. has been in business for close to 70 years and is known in the industry for cart innovations such as pinpoint maneuverability, standardized end grills, removable convenience bars, multi-shelf condo carts etc. Top property managers recognize the impact and the impression made by baggage carts when new guests arrive. This reflects on the entire hotel operation. “The first part of a guest’s experience at a hotel is when moving their luggage on a cart with or without a bellman’s assistance. First impressions count. You want your equipment to be consistent with your overall service standards. A luggage cart that is difficult to steer, that squeaks, does not work properly, safely, or is unsightly can tarnish that image. Luggage carts with worn finishes, dirty carpeting, scuffed bumpers, and wobbling wheels speak poorly about the maintenance level at the hotel,” states Robert Betensky, Executive Vice-President at Glaro Inc. Even carts that may be working well may have been so heavily used that they are now unsightly and unsafe to the point of diminishing the stature of the hotel or property. Glaro Inc. bellman carts serve property owners by helping them maintain a top service environment with high functioning, attractive equipment. “Many facilities may not realize that the baggage carts they are currently using will not last through another season. To sustain a high standard, you need confidence in your hotel equipment,” commented Robert Betensky. More and more, hotel managers are calling their supply dealers to upgrade their hotel luggage carts in advance of their busiest season to make sure that as volume increases, they can maintain quality standards. By anticipating the need for new luggage carts now, purchasing managers can avoid having to replace equipment in the middle of the busiest time of year. Once a dealer or supplier determines they need new equipment, USA manufacturers with 1-3 day shipping policy, such as Glaro Inc., make sure that every request is made to order. Glaro ships more quickly than any other cart manufacturer. 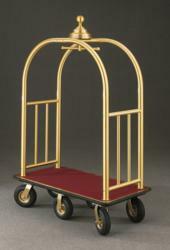 “We make sure that our customers receive their bellman carts fast." Glaro, Inc. (glaro.com) is a leading USA manufacturer of commercial and consumer aluminum products sold through dealers for close to 70 years. All products ship in 1 to 3 days. Glaro products are the result of a focus on thoughtful innovation and design. Product lines include bellman carts, metal trash receptacles, recycling receptacles, smokers’ posts and receptacles, crowd control posts and systems, sign frames, and directories, coat hanging equipment, umbrella stands, planters, and key drop boxes. A diverse selection of models in 31 finishes is produced in the Hauppauge, New York plant by skilled Glaro craftsmen. The company is known for its quality merchandise and its ability to consistently quick ship all products. The customer service department provides unusually prompt personal service and is sensitive to the needs of dealers.